Delivery method plays an integral role in creating successful deals for any online business. Because people have different objectives when making a purchase either for themselves or for other people, if an online merchants can offer customers various ways to get the products, they can serve and satisfy more shopping doers. That is the reason why Magento 2 Gift Card extension provides multi delivery methods with the aim to meet both shop owners and customers’ demands. Along with the development of globalization is the switch in the way people present gift to others. Recent years experienced the increasing demands of people worldwide for purchasing gift cards due to its outstanding advantages and convenience over other goods, especially delivery methods. There are several ways offered for buyers when they decide to purchase a voucher for their family and friends such as via email address, phone number, and post office. Therefore, even they are thousand miles apart from each other, they can still send a present easily and conveniently on the right date and time they want. Besides, if they want to a gift for themselves, they can choose among different choices to keep it that make customers happier as they have the right to decide. With the default setting of Gift Card extension, users can choose among different delivery methods for their stores or apply all when sending a gift voucher. To apply one method, shop admins only need to navigate configuration from Admin Panel, then make changes to default setting. 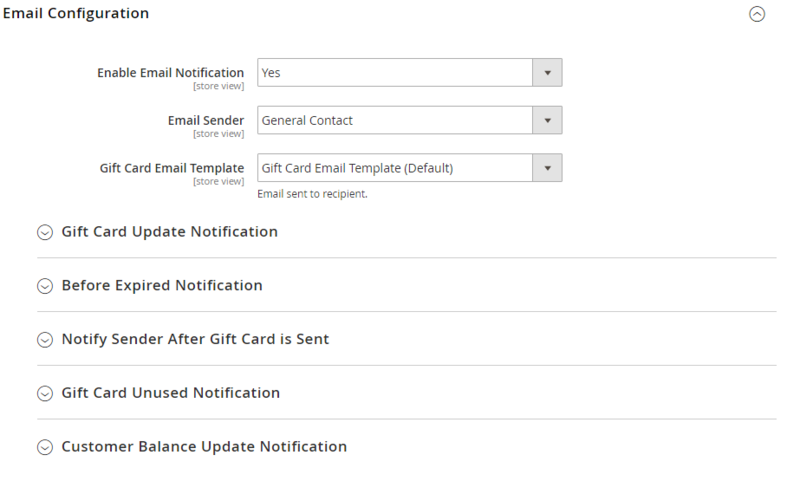 For example, to send a certificate via email, store owners can make adjustments to sub-parts in Email Configuration. Once customers decide the templates and designs for their cards, they have to complete their deals by provide necessary information. Depend on the delivery method selected, customers have to fill in different detailed contacts. If customers choose to send gift cards via email, they have to fill in recipient email address, sender name, and recipient name. In case, gift vouchers are expected to be shipped via post office, customers only need to provide sender and receiver name. 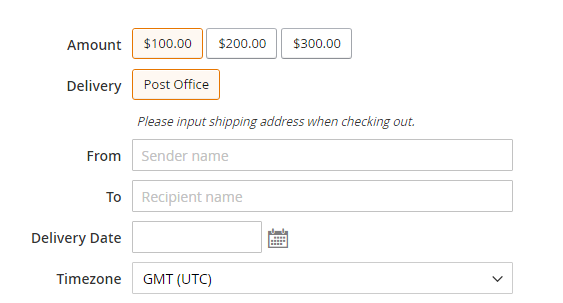 However, in the checkout process, they have to fill in recipient address in details. Once shoppers want to transfer their gift certificates through text message, they have to provide information about recipient phone number, sender name, and recipient name. When purchasers prefer to print their cards at home, all they need to do is just providing sender name and recipient name. After that, they can print the vouchers via their confirmation emails or their accounts. No matter which shipping method is chosen, customers still are allowed to set up date and time they expect the cards to be handed to recipients. Additionally, attaching a message is optional for anyone who wants to convey feelings for his family or friends. In conclusion, Magento 2 Gift Card extension is user-friendly to both shop admins and customers. If you want to facilitate your online stores right now to keep updated with current trend or find more information about this helpful module, let’s click the button bellow for more details. How to use Gift Card Offline and Export Gift Codes?